7) Loading testing: All qualified generator sets are subjected to a comprehensive performance test which inclides 0% load, 25% load, 50% load, 75% load, 100% load and 110% load and to check, verify that all control systems, alarm and shut-own protection. 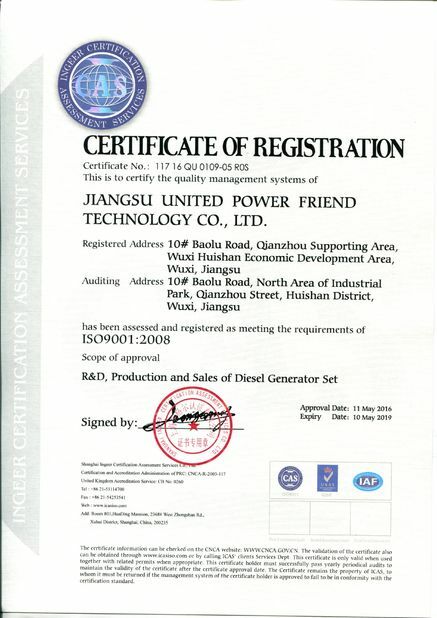 JIANGSU UNITED POWER FRIEND TECHNOLOGY CO., LTD is focusing on power generator products and service in China.Being in the power generation field for more than 10 years, we have very good connection with G-Drive Engines and brand alternators. 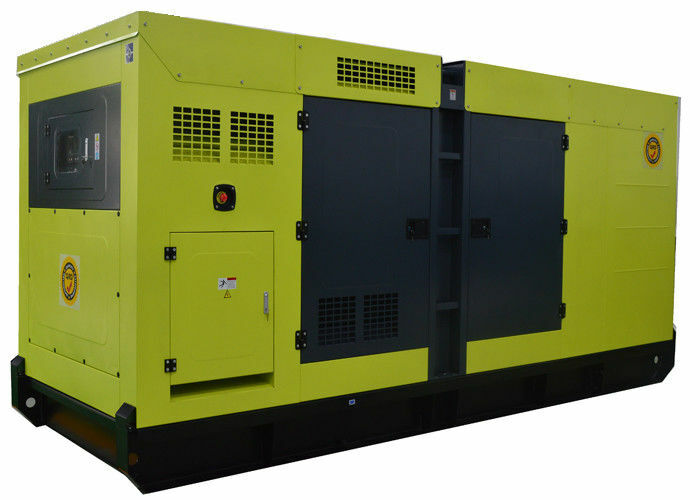 We are not only assembling the generator set, but alsogiving you the best solution to meet your special needs on projects and your clients. 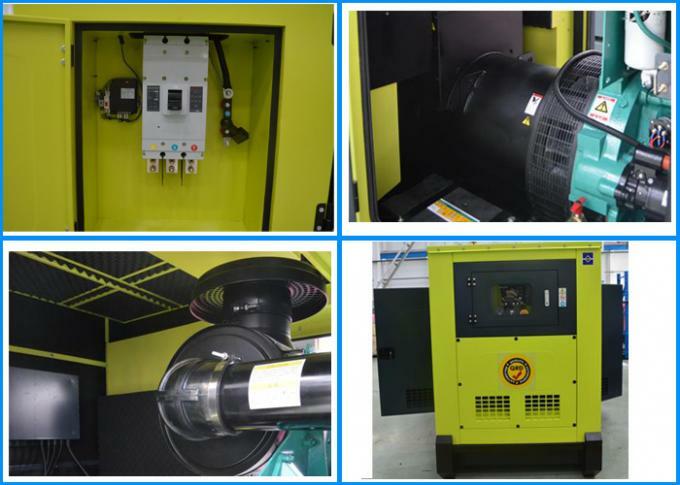 1) Each engine shall be tested at manufacturer’s workshop to certify the engine output according to present standard and fuel consumption in accordance with the site operating condition specified by purchaser on the specification datasheet. 2) All relevant information drawings pertinent to the testing and test procedure shall be transmitted to the purchaser in advance of the test date notification. 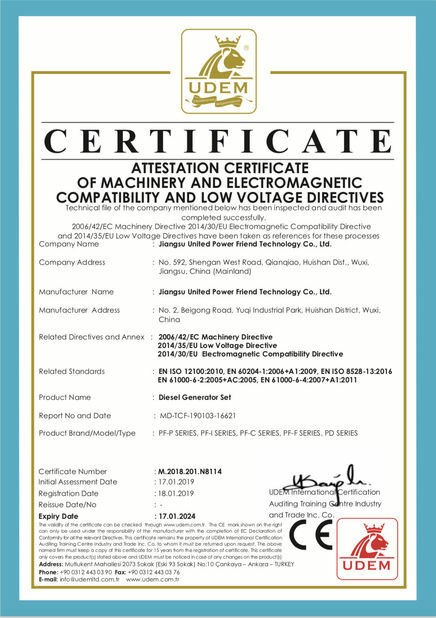 3) All accompanied documents are corresponding to the actual situation of generators, including the Qualified Certificate, Parameters and the Performance Index. 1) Guarantee Period: One year or 1000 running hours, depends on whichever comes first. 2) During the guarantee period, the spare-parts will be sent through your shipping agency in China. 3) Spare-parts can also be sent by air express. 4) 24 hours service hotline is available for customers. 1. If you are interested in our products we sincerely invite you to take a visit of our factory when you are in China. We can drive to pick you up and visit our factory. 2. Suggest the best choice or referential suggestion based on customers’ information. Answer all questions about the product from customer. 3. Build customers’ profiles, follow-up service, make regular calls on customers.